Member states of the United Nations, all of which are sovereign states, though not all sovereign states are necessarily members. While according to the declarative theory of statehood, a sovereign state can exist without being recognised by other sovereign states, unrecognised states will often find it hard to exercise full treaty-making powers and engage in diplomatic relations with other sovereign states. Westphalian sovereignty is the concept of nation-state sovereignty based on territoriality and the absence of a role for external agents in domestic structures. It is an international system of states, multinational corporations, and organizations that began with the Peace of Westphalia in 1648. Sovereignty is a term that is frequently misused. Up until the 19th century, the radicalised concept of a "standard of civilization" was routinely deployed to determine that certain people in the world were "uncivilised", and lacking organised societies. That position was reflected and constituted in the notion that their "sovereignty" was either completely lacking or at least of an inferior character when compared to that of the "civilized" people." Lassa Oppenheim said, "There exists perhaps no conception the meaning of which is more controversial than that of sovereignty. It is an indisputable fact that this conception, from the moment when it was introduced into political science until the present day, has never had a meaning which was universally agreed upon." In the opinion of H. V. Evatt of the High Court of Australia, "sovereignty is neither a question of fact, nor a question of law, but a question that does not arise at all." Sovereignty has taken on a different meaning with the development of the principle of self-determination and the prohibition against the threat or use of force as jus cogens norms of modern international law. The United Nations Charter, the Draft Declaration on Rights and Duties of States, and the charters of regional international organizations express the view that all states are juridically equal and enjoy the same rights and duties based upon the mere fact of their existence as persons under international law. The right of nations to determine their own political status and exercise permanent sovereignty within the limits of their territorial jurisdictions is widely recognized. Named after the 1648 Treaty of Westphalia, the Westphalian System of state sovereignty, which according to Bryan Turner is "made a more or less clear separation between religion and state, and recognized the right of princes 'to confessionalize' the state, that is, to determine the religious affiliation of their kingdoms on the pragmatic principle of cuius regio eius religio [whose realm, his religion]." Before 1900 sovereign states enjoyed an absolute immunity from the judicial process, derived from the concepts of sovereignty and the Westphalian equality of states. First articulated by Jean Bodin, the powers of the state are considered to be suprema potestas within territorial boundaries. Based on this, the jurisprudence has developed along the lines of affording immunity from prosecution to foreign states in domestic courts. In The Schooner Exchange v. M'Faddon, Chief Justice John Marshall of the United States Supreme Court wrote that the "perfect equality and absolute independence of sovereigns" has created a class of cases where "every sovereign is understood to waive the exercise of a part of that complete exclusive territorial jurisdiction, which has been stated to be the attribute of every nation". Absolute sovereign immunity is no longer as widely accepted as it has been in the past, and some countries including the United States, Canada, Singapore, Australia, Pakistan and South Africa have introduced restrictive immunity by statute, which explicitly limits jurisdictional immunity to public acts, but not private or commercial ones, though there is no precise definition by which public acts can easily be distinguished from private ones. State recognition signifies the decision of a sovereign state to treat another entity as also being a sovereign state. Recognition can be either expressed or implied and is usually retroactive in its effects. It does not necessarily signify a desire to establish or maintain diplomatic relations. There is no definition that is binding on all the members of the community of nations on the criteria for statehood. In actual practice, the criteria are mainly political, not legal. L.C. Green cited the recognition of the unborn Polish and Czechoslovak states in World War I and explained that "since recognition of statehood is a matter of discretion, it is open to any existing State to accept as a state any entity it wishes, regardless of the existence of territory or of an established government." The constitutive theory of statehood defines a state as a person of international law if, and only if, it is recognised as sovereign by at least one other state. This theory of recognition was developed in the 19th century. Under it, a state was sovereign if another sovereign state recognised it as such. Because of this, new states could not immediately become part of the international community or be bound by international law, and recognised nations did not have to respect international law in their dealings with them. In 1815, at the Congress of Vienna the Final Act recognised only 39 sovereign states in the European diplomatic system, and as a result it was firmly established that in the future new states would have to be recognised by other states, and that meant in practice recognition by one or more of the great powers. International Law does not say that a State is not in existence as long as it isn't recognised, but it takes no notice of it before its recognition. Through recognition only and exclusively a State becomes an International Person and a subject of International Law. By contrast, the declarative theory of statehood defines a state as a person in international law if it meets the following criteria: 1) a defined territory; 2) a permanent population; 3) a government and 4) a capacity to enter into relations with other states. According to declarative theory, an entity's statehood is independent of its recognition by other states, as long as the sovereignty was not gained by military force. The declarative model was most famously expressed in the 1933 Montevideo Convention. Article 3 of the Montevideo Convention declares that political statehood is independent of recognition by other states, and the state is not prohibited from defending itself. In contrast, recognition is considered a requirement for statehood by the constitutive theory of statehood. An important part of the convention was Article 11 that prohibits using military force to gain sovereignty. A similar opinion about "the conditions on which an entity constitutes a state" is expressed by the European Economic Community Opinions of the Badinter Arbitration Committee, which found that a state was defined by having a territory, a population, government, and capacity to enter into relations with other states. State practice relating to the recognition of states typically falls somewhere between the declaratory and constitutive approaches. International law does not require a state to recognise other states. Recognition is often withheld when a new state is seen as illegitimate or has come about in breach of international law. Almost universal non-recognition by the international community of Rhodesia and Northern Cyprus are good examples of this, the former only having been recognized by South Africa, and the latter only recognized by Turkey. In the case of Rhodesia, recognition was widely withheld when the white minority seized power and attempted to form a state along the lines of Apartheid South Africa, a move that the United Nations Security Council described as the creation of an "illegal racist minority régime". In the case of Northern Cyprus, recognition was withheld from a state created in Northern Cyprus. International law contains no prohibition on declarations of independence, and the recognition of a country is a political issue. As a result, Turkish Cypriots gained "observer status" in the Parliamentary Assembly of the Council of Europe, and their representatives are elected in the Assembly of Northern Cyprus; and Northern Cyprus became an observer member of the Organisation of Islamic Cooperation and the Economic Cooperation Organization. Most sovereign states are states de jure and de facto (i.e., they exist both in law and in reality). However, a state may be recognised only as a de jure state, in that it is recognised as being the legitimate government of a territory over which it has no actual control. For example, during the Second World War, governments-in-exile of a number of continental European states continued to enjoy diplomatic relations with the Allies, notwithstanding that their countries were under Nazi occupation. The PLO and Palestinian Authority claim that the State of Palestine is a sovereign state, a claim which has been recognised by most states, though the territory it claims is under the de facto control of Israel. Other entities may have de facto control over a territory but lack international recognition; these may be considered by the international community to be only de facto states. They are considered de jure states only according to their own law and by states that recognise them. For example, Somaliland is commonly considered to be such a state. For a list of entities that wish to be universally recognised as sovereign states, but do not have complete worldwide diplomatic recognition, see the list of states with limited recognition. Although the terms "state" and "government" are often used interchangeably, international law distinguishes between a non-physical state and its government; and in fact, the concept of "government-in-exile" is predicated upon that distinction. States are non-physical juridical entities, and not organisations of any kind. However, ordinarily, only the government of a state can obligate or bind the state, for example by treaty. Generally speaking, states are durable entities, though it is possible for them to become extinguished, either through voluntary means or outside forces, such as military conquest. Violent state abolition has virtually ceased since the end of World War II. Because states are non-physical juridical entities, it has been argued their extinction cannot be due to physical force alone. Instead, the physical actions of the military must be associated with the correct social or judiciary actions in order to abolish a state. The ontological status of the state has been the subject of debate, specially, whether or not the state, being an object that no one can see, taste, touch, or otherwise detect, actually exists. It has been argued that one potential reason as to why the existence of states has been controversial is because states do not have a place in the traditional Platonist duality of the concrete and the abstract. Characteristically, concrete objects are those that have position in time and space, which states do not have (though their territories have spatial position, but states are distinct from their territories), and abstract objects have position in neither time nor space, which does not fit the supposed characteristics of states either, since states do have temporal position (they can be created at certain times and then become extinct at a future time). Therefore, it has been argued that states belong to a third category, the quasi-abstract, that has recently begun to garner philosophical attention, especially in the area of documentality, an ontological theory that seeks to understand the role of documents in understanding all of social reality. Quasi-abstract objects, such as states, can be brought into being through document acts, and can also be used to manipulate them, such as by binding them by treaty or surrendering them as the result of a war. Scholars in international relations can be broken up into two different practices, realists and pluralists, of what they believe the ontological state of the state is. Realists believe that the world is one of only states and interstate relations and the identity of the state is defined before any international relations with other states. On the other hand, pluralists believe that the state is not the only actor in international relations and interactions between states and the state is competing against many other actors. Another theory of the ontology of the state is that the state is a spiritual, or "mystical entity" with its own being, distinct from the members of the state. The German Idealist philosopher Georg Hegel (1770–1831) was perhaps the greatest proponent of this theory. The Hegelian definition of the state is "the Divine Idea as it exists on Earth". Since the end of World War II, the number of sovereign states in the international system has surged. Some research suggests that the existence of international and regional organisations, the greater availability of economic aid, and greater acceptance of the norm of self-determination have increased the desire of political units to secede and can be credited for the increase in the number of states in the international system. Harvard economist Alberto Alesina and Tufts economist Enrico Spolaore argue in their book, Size of Nations, that the increase in the number of states can partly be credited to a more peaceful world, greater free trade and international economic integration, democratisation, and the presence of international organisations that co-ordinate economic and political policies. "sovereign", The American Heritage Dictionary of the English Language (4th ed. ), Houghton Mifflin Company, 2004, retrieved 21 February 2010, adj. 1. Self-governing; independent: a sovereign state. "sovereign", The New Oxford American Dictionary (2nd ed. ), Oxford: Oxford University Press, 2005, ISBN 978-0-19-517077-1, adjective ... [ attrib. ] (of a nation or state) fully independent and determining its own affairs. ^ Krasner, Stephen D. (1999). Sovereignty: Organised Hypocrisy. Princeton University Press. ISBN 978-0-691-00711-3. ^ Núñez, Jorge Emilio (2013). "About the Impossibility of Absolute State Sovereignty". International Journal for the Semiotics of Law. 27 (4): 645–664. doi:10.1007/s11196-013-9333-x. ^ Akweenda, Sackey (1997). "Sovereignty in cases of Mandated Territories". International law and the protection of Namibia's territorial integrity. Martinus Nijhoff Publishers. p. 40. ISBN 978-90-411-0412-0. ^ "Draft Declaration on Rights and Duties of States" (PDF). UN Treaty Organization. 1949. Retrieved 21 November 2010. ^ "General Assembly resolution 1803 (XVII) of 14 December 1962, "Permanent sovereignty over natural resources"". United Nations. Archived from the original on 18 February 2011. Retrieved 21 November 2010. ^ "International Covenant on Civil and Political Rights". ^ Turner, Bryan (July 2007). "Islam, Religious Revival and the Sovereign State". Muslim World. 97 (3): 405–418. ^ Simpson, Gerry (2004). Great Powers and Outlaw States: Unequal Sovereigns in the International Legal Order. Cambridge University Press. ^ a b Bankas, Ernest K (2005). The State Immunity Controversy in International Law: Private Suits Against Sovereign States in Domestic Courts. Springer. ^ a b Hillier, Tim (1998). Sourcebook on Public International Law. Routledge. pp. 201–2. ISBN 978-1-85941-050-9. ^ Lassa Oppenheim, Ronald Roxburgh (2005). International Law: A Treatise. The Lawbook Exchange, Ltd. p. 135. ISBN 978-1-58477-609-3. ^ Hersch Lauterpacht (2012). Recognition in International Law. Cambridge University Press. p. 419. ISBN 9781107609433. ^ "CONVENTION ON RIGHTS AND DUTIES OF STATES". www.oas.org. ^ Castellino, Joshua (2000). International Law and Self-Determination: The Interplay of the Politics of Territorial Possession With Formulations of Post-Colonial National Identity. Martinus Nijhoff Publishers. p. 77. ISBN 978-90-411-1409-9. ^ Shaw, Malcolm Nathan (2003). International law (5th ed.). Cambridge University Press. p. 369. ISBN 978-0-521-53183-2. ^ BBC The President of the International Court of Justice (ICJ) Hisashi Owada (2010): "International law contains no prohibition on declarations of independence." ^ Oshisanya, An Almanac of Contemporary and Comperative Judicial Restatement, 2016 p.64: The ICJ maintained that ... the issue of recognition was a political. ^ a b B'Tselem - The Israeli Information Center for Human Rights in the Occupied Territories: Israel's control of the airspace and the territorial waters of the Gaza Strip, Retrieved 24 March 2012. 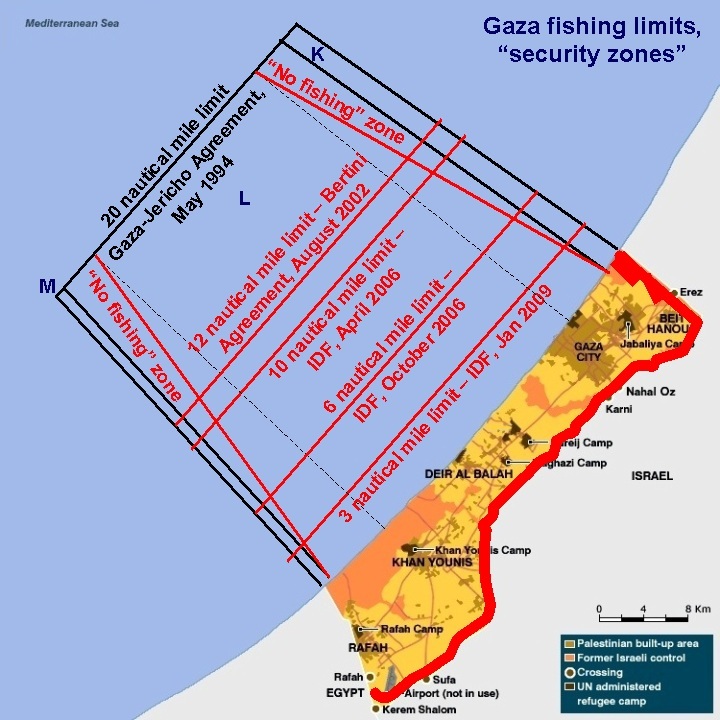 ^ "Map of Gaza fishing limits, "security zones"". ^ Israel's Disengagement Plan: Renewing the Peace Process Archived 2 March 2007 at the Wayback Machine: "Israel will guard the perimeter of the Gaza Strip, continue to control Gaza air space, and continue to patrol the sea off the Gaza coast. ... Israel will continue to maintain its essential military presence to prevent arms smuggling along the border between the Gaza Strip and Egypt (Philadelphi Route), until the security situation and cooperation with Egypt permit an alternative security arrangement." ^ Gold, Dore; Institute for Contemporary Affairs (26 August 2005). "Legal Acrobatics: The Palestinian Claim that Gaza is Still "Occupied" Even After Israel Withdraws". Jerusalem Issue Brief, Vol. 5, No. 3. Jerusalem Center for Public Affairs. Retrieved 16 July 2010. ^ Bell, Abraham (28 January 2008). "International Law and Gaza: The Assault on Israel's Right to Self-Defense". Jerusalem Issue Brief, Vol. 7, No. 29. Jerusalem Center for Public Affairs. Retrieved 16 July 2010. ^ "Address by Foreign Minister Livni to the 8th Herzliya Conference" (Press release). Ministry of Foreign Affairs of Israel. 22 January 2008. Archived from the original on 26 October 2011. Retrieved 16 July 2010. ^ Salih, Zak M. (17 November 2005). "Panelists Disagree Over Gaza's Occupation Status". University of Virginia School of Law. Archived from the original on 3 March 2016. Retrieved 16 July 2010. ^ "Israel: 'Disengagement' Will Not End Gaza Occupation". Human Rights Watch. 29 October 2004. Retrieved 16 July 2010. ^ Arieff, Alexis (2008). "De facto Statehood? The Strange Case of Somaliland" (PDF). Yale Journal of International Affairs. 3: 60–79. Retrieved 4 January 2010. ^ "The List: Six Reasons You May Need A New Atlas Soon". Foreign Policy Magazine. July 2007. Retrieved 4 January 2010. ^ "Overview of De-facto States". Unrepresented Nations and Peoples Organization. July 2008. Retrieved 4 January 2010. ^ Wiren, Robert (April 2008). "France recognises de facto Somaliland". Les Nouvelles d'Addis Magazine. Retrieved 4 January 2010. ^ Robinson, E. H. (2013). "The Distinction Between State and Government" (PDF). The Geography Compass. 7 (8): 556–566. ^ a b Crawford, J. (2006). The Creation of States in International Law (2nd ed.). Oxford: Clarendon Press. ISBN 978-0-19-826002-8. ^ Robinson, Edward Heath (2010). "An Ontological Analysis of States: Organizations vs. Legal Persons" (PDF). Applied Ontology. 5: 109–125. ^ Fazal, Tanisha M. (1 April 2004). "State Death in the International System". International Organization. 58 (2): 311–344. doi:10.1017/S0020818304582048. ISSN 1531-5088. ^ Robinson, Edward Heath (2011). "The Involuntary Extinction of States: An Examination of the Destruction of States though the Application of Military Force by Foreign Powers since the Second World War" (PDF). The Journal of Military Geography. 1: 17–29. ^ Ringmar, Erik (1996). "On the ontological status of the state". European Journal of International Relations. 2 (4): 439–466. doi:10.1177/1354066196002004002. ^ a b Robinson, Edward H. (2014). "A documentary theory of states and their existence as quasi-abstract entities" (PDF). Geopolitics. 19 (3): 461–489. doi:10.1080/14650045.2014.913027. Archived from the original (PDF) on 3 March 2016. Retrieved 16 September 2014. ^ Ringmar, Erik (1996). "On the Ontological Status of the State". European Journal of International Relations. 10 (2). ^ Schmandt & Steinbicker 1954, p. 71 (citing Hegel's Philosophy of History, trans. J. Sibree [New York: Wiley Book Co., 1934]); see also Hegel, Georg Wilhelm Friedrich (2012) . The Philosophy of History. Courier Corporation. p. 39. ISBN 978-0-486-11900-7. ^ "The SAGE Handbook of Diplomacy". SAGE Publications. pp. 294–295. Retrieved 17 November 2016. ^ Fazal, Tanisha M.; Griffiths, Ryan D. (1 March 2014). "Membership Has Its Privileges: The Changing Benefits of Statehood". International Studies Review. 16 (1): 79–106. doi:10.1111/misr.12099. ISSN 1468-2486. ^ "The State of Secession in International Politics". E-International Relations. Retrieved 16 November 2016. ^ "The Size of Nations". MIT Press. Retrieved 16 November 2016. Schmandt, Henry J.; Steinbicker, Paul G. (1954). Fundamentals of Government (2nd printing, 1956 ed.). Bruce Publishing Company. Lauterpacht, Hersch (2012). Recognition in International Law. Cambridge University Press. ISBN 9781107609433.